Sometimes you pick the meal, sometimes the meal picks you. The latter happened this week, when I came upon a gorgeous haul of Pink Lady apples from Mt. Moriah Farms. I quickly filled a bag with 10 or 12, not certain what we would do with all of them, but confident that a plan would become clear. Placing the apples alongside some leeks we had purchased earlier, I realized that the meal I should make—the meal I had to make—involved that most apple-loving of meats, the humble pork chop. For the meal I envisioned, I needed thick pork chops. Pork chops thicker than any I had seen in Davis. Fortunately, I had a hunch about where these might be obtained: Corti Brothers in Sacramento, a 64 year old Italian grocery that I had heard tales of for years, but not yet had the pleasure of visiting. Corti Brothers did not disappoint, with nearly 2-inch thick pork chops that were a pound each. We bought three, along with some other treats. A plan was coming together. Back in the kitchen, I submerged the pork chops in a marinade of Wild Turkey Bourbon, sel gris, fennel seed, crushed red pepper and Pernod. The anise aroma of the Pernod filled the room, conjuring thoughts of a robust and complex cocktail. I figured the perfect opener to our pork meal would be a cocktail that offered a preview of the pork’s flavors—apples, anise, whiskey—an apple Sazerac cocktail. I am a huge fan of rye whiskies, and, with the recent rye shortage, have been stocking up like a squirrel preparing for winter. I believe I purchased the last bottle of Wild Turkey Rye in the Sacramento Valley and recently acquired a dusty bottle of Sazerac Rye, a spirit that has been absent from the shelves of both liquor stores and bars for at least nine months. Bravely, like Abraham acting in faith but against judgement, I emptied nearly half of my Sazerac into a carafe over a chopped apple. 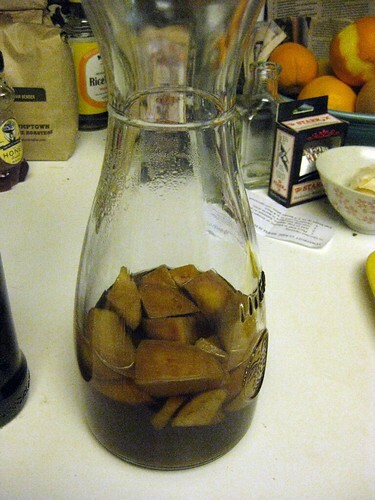 I left the whiskey to infuse overnight, then strained the apples from it. Tasting it, there was a light sweetness, but the apple was barely noticeable, still trapped within the pithy fruit, along with some of my precious rye. I transferred the apples to a measuring cup and muddled them aggressively, then strained this juice back into the whiskey, creating a charming, apple accented rye. Back to the pork. I chopped the white of two leeks, and sautÃ©ed them in some olive oil, then seared each of the pork chops over medium-high heat. Once the pork chops were seared, I stood them on edge, about half an inch apart, and filled the pot with 4 chopped apples. I reduced the heat to low, and added a couple ounces of water, then covered the pot. I left the pork to braise for about 2 hours, occasionally rearranging the apple pieces to sit lower in the pot as they softened, and flipping the pork chops once. After removing the pork chops and slicing them, I turned the heat up again, to cook down the apple and leek mixture for a few more minutes. I strained the apple-leek solids out to serve on top of the pork. While the pork rested, I mixed up a batch apple Sazerac cocktails for our guests, which we served right before the food was brought to the table. The cocktails’ offered a perfect introduction to the pork, which was sweet and fruity with a hint of anisette. 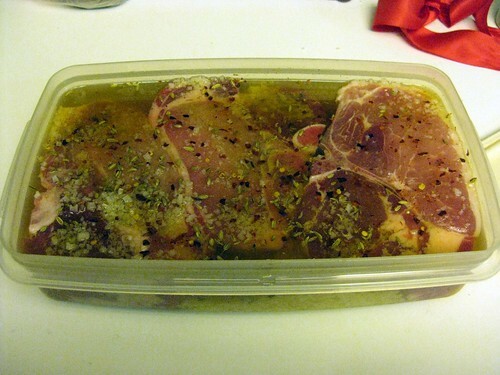 Combine all marinade ingredients and cover pork for 12-24 hours. Chop leek whites and sautÃ©e in olive oil in large pot. Push leeks to side and sear each pork chop on both sides, 2-3 minutes a side. 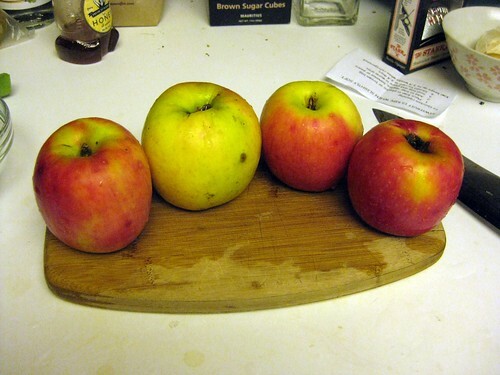 Chop apples into 1/2 inch pieces. 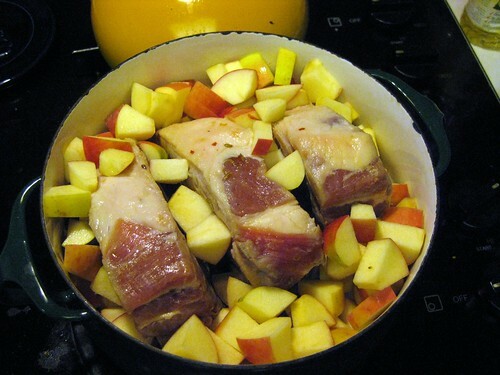 Stand pork chops on edge and fill pot with apples. Add a few ounces of water and cover. Cook over low heat for 2 hours, turning pork chops once. Remove pork chops and increase heat. Cook leeks and apples an additional 10 minutes. Serve strained apples and leeks over pork. 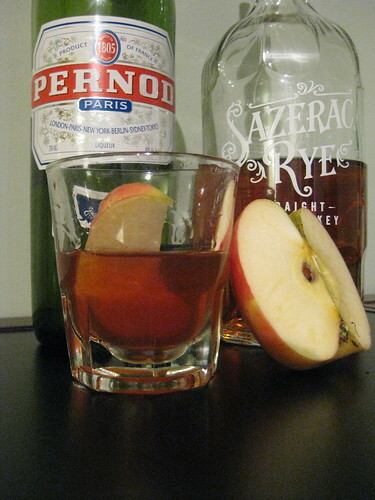 Rinse glass with Pernod and place apple wedge at bottom of glass. In a cocktail shaker, combine rye, simple syrup and bitters. Stir with ice for 15 seconds. Strain over apple and serve. * Soak chopped apple in 12 oz whiskey for 24 hours. Muddle apples to release juices. Strain into a clean bottle for storage. ** Combine 1/2 cup sugar with 1/4 cup water and cook over low heat until sugar is dissolved and mixture begins to boil. Let cool and refrigerate.